Aven makes a line of Accu-Cut hard wire cutters, and they’re actually very affordable (for what they are). Last week I posted about Schmitz mini pliers and cutters, and NewtonsApple brought up Aven’s German-made carbide-jaw cutters. 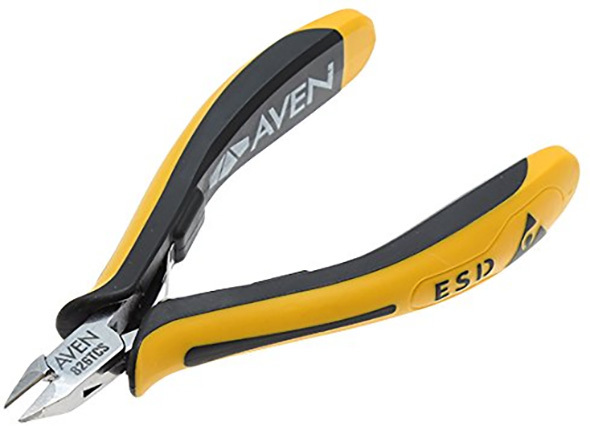 I’m familiar with Aven tools, but I don’t think I’ve seen these hard wire cutters before. Aven says their hard-wire cutters are designed for cutting materials such as stents, catheters, nitinol, component wires, piano wire, and other such materials. The jaws are made from a stainless steel alloy with brazed tungsten carbide inserts. The tungsten carbide cutter blades have a hardness rating of 80-82 HRC. Although suited for medical applications, they can also be used for electronics work, or other precision cutting tasks. The “medical-grade” mirror-finish polish should make the cutters easy to clean. The cutters feature an ESD-safe handle grip, box joint construction, and dual leaf springs. The different models have different cutting capacities, ranging from 0.2/34 to 0.6/22 piano wire, 0.6/22 to 1.0/18 hard wire, and 1.6/14 to 2.0/12 soft wire, with the numbers referring to mm/wire gauge. These cutters are made in Germany. 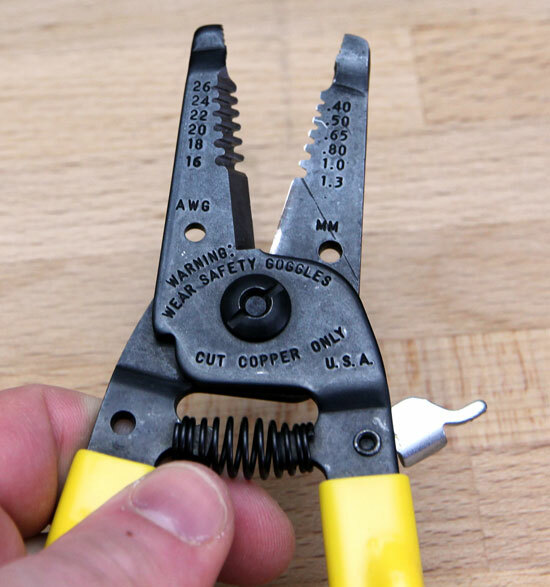 It’ll be very difficult to confirm which company makes Aven’s Accu-Cut hard-wire cutters, but I have seen those handle grips before, on the NWS precision cutters I ordered last winter. If you’re familiar with NWS, you probably already know that their pliers and cutters are made in Germany. Despite using miniature and precision pliers regularly, I can’t say I’ve needed hard-wire cutter blades in a tool this size before. Still, it seems like a pair or two would be “buy it for life” tools for hobbyists that work with hard wires. Professional and industrial users are likely to get a lot of use out of each pair before they start seeing wear. A big benefit of the stainless steel construction is that the pliers will be easy to clean. And since they’re not chrome plated, should you damage them you won’t get chrome flaking off into delicate circuits or components. 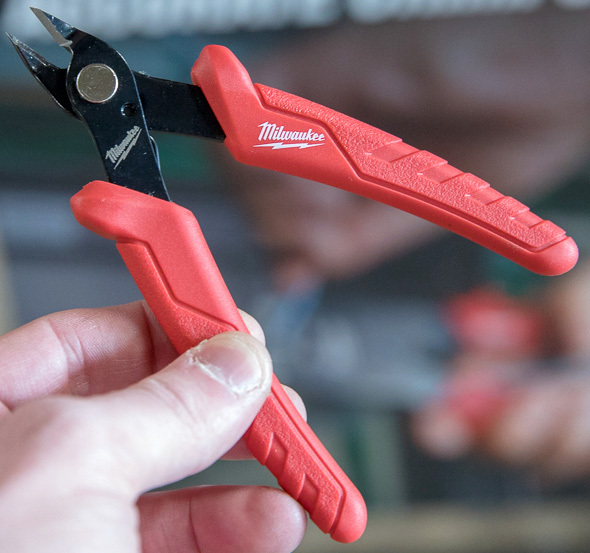 Schmitz, the brand we briefly talked about the other day, also makes ESD-safe hard wire cutters with tungsten carbide-tipped blades. Those are $90 each. If you think you need precision hard-wire cutters, and aren’t sure which to buy, the 10821TCS oval head 125mm semi-flush cutter (Buy Now) has the highest cutting capacity. The 120mm oval head and 125mm taper head cutters have slightly lower cutting capacity, and the 120mm mini taper head cutters have the lowest. Generally, semi-flush cutters can last longer than flush-cutting, but the cut typically isn’t as perfectly clean. Oval head cutters are stronger, due to there being more material behind the cutting blades, while taper head cutters can fit in tighter spaces. Taper head cutters with relief have material removed from underneath the jaws, allowing them to make cuts in even tighter spaces. Thank you to NewtonsApple for the tip! Great info- I never looked into aven for hard-wire stuff before. Hard wire cutters are great for cutting your guitar/banjo/mandolin strings, too- and small enough to fit into a case. First, they’re $30 each, as mentioned in the post. But more importantly, good luck trying to use a multi-tool’s cutters for flush-cutting, in tight spaces, or around the types of obstructions these cutters can reach under or around. Awesome! More stuff I didn’t know about but I gotta’ have. I have some piano wire out in the shop that I can testify will play havoc with regular cutters. Way more ($121) at Zoro. Zoro sometimes goes according to list price, even if it’s highly inflated compared to street pricing. Aven’s site says $29.95 is the sale price, and $92 the list price. I put an order in with Amazon yesterday shortly after Stuart posted the article. 1 flush, 1 semi flush. Today Amazon cancelled the order because Aven is “out of stock” and the price is now $140. Anybody else get their order cancelled? It looks like Aven is the seller on Amazon. Some of the SKUs are now out of stock on their site too. The others are still in stock at the $30 price, on Amazon and Aven directly. At the time of this posting, Aven had 7 different SKUs on their site. Now, there are 5, and one of those is marked as being out of stock. I’d say that either they sold out of some of the pliers styles, or they don’t really want to sell those styles at that price. Since the available models are still $30, I think they simply sold out. They might have had an inaccurate number of inventory on Amazon, leading to the cancellation. I don’t have an Aven contact, but will see what I can find out. Interesting. I hadn’t looked to see who the was the seller. It looks like Aven is likely clearing these out in some form. Amazon will sometimes drive wacky pricing like this. It is much less common that third party manufacture/sellers do these sort of things. Now I wonder if I came across these cutters scouring Amazon for discount pricing. There are some interesting antics Amazon has employed at times. Thanks for the update, I went back and found a semi flush one I’ll give a try. By the way, I love your site, check it way too frequently. Not sure if you have saved me or cost me piles of money, But I certainly have enjoyed getting to know about Wera, Stahlwille, and the like from the reviews and deal alerts. These would be good for thicker electronic components like diodes, in a diode full wave rectifier (as opposed to a bridge rectifier) or in transistors. Those generally push the limits in electronic cutters. Cutters with low profile tips can allow you to cut out multipin through hole components so you can desolder individual pins. Helpful if you have a situation you are concerned about dumping a bunch of heat into a board or have unusual access. Hey, that’s me. Carbide cutters are great. Under all use besides high volume production they never dull or get dents from mild abuse. Only downside is if you get over ambitious, they fail catastrophically. The cutting edge chips and usually takes out a large section. I get the sense that Aven sources everything and doesn’t have any manufacturing. Elora has pretty much the same cutters under their brand. There is a chance they are making them, but wrenches and sockets are really their specialty and these are a bit different. It would be cool to confirm where these are coming from. At $29.95 these are likely a very good deal. Typical Erem, Swanstrom, Tronex cutters we are using in medical device production are $90-$250. 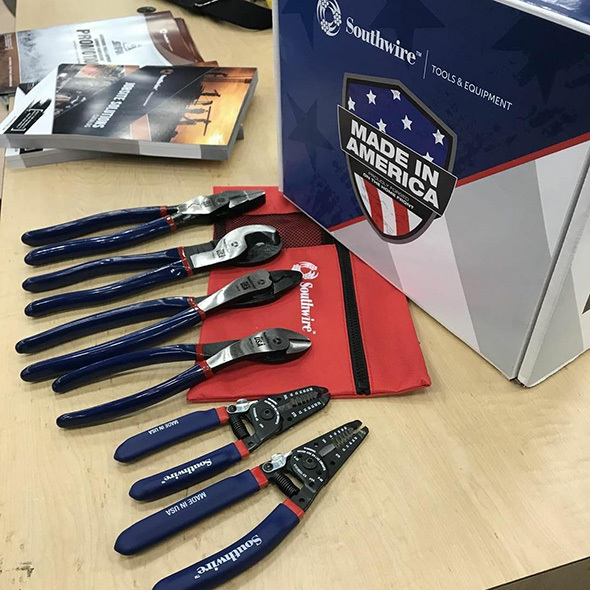 I would buy a pair, but I pretty much have a lifetime supply of precision carbide cutters from buying equipment from facilities that have closed. I would go for a pair of oblique cutters if available. Looking forward to a quality report from someone who gets a pair. This is going to sound like a sin of some sort… but if you look at the Jeweller’s Tools on the site I get my jewellery making supplies from (An American company I might add) you’ll notice that $90 for a pair of side cutters in precision sizing to be relatively cheap. Yeah, they have pliers, tweezers, and all manner of specialized tools for doing jewellery, but the users on THIS site are probably most interested in their “German Made” pliers and cutters. They range all the way from $9 right on up to $150. And if you look at their design? You will be astonished to find the dimensions and contours to be identical. When you started talking about the precision pliers earlier this week and last, I looked into it again. (As in MY Precision tools I bought.) I found out this “Ergonomic” design is no coincidence. Across all the German-Made companies, there’s an actual standardization for the ergonomics of these pliers. And for the price? They aren’t messing around with quality. These are all made to be lifetime tools. Even down to the $9 ones. What makes the price skyrocket is the blade material, and whether there’s also an ESD layer in the handles. Beyond that, they’re all using the same standards to make these precision plier-class tools. The cheap ones are plain steel. Meant to be disposable by many standards. But they work really well on Tin, Silver, and Gold. The $60-$90 range are meant for all those, plus Copper, Bronze, and Brass. Of course, this is Jewellery industry data, not Electronics, so the metals mentioned are quite weird comparatively. 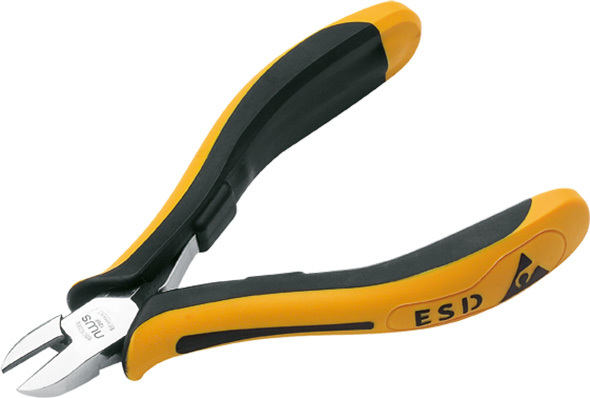 Also at the $60-$90 range, you get the softer steel pliers accompanied by ESD layers, and then the +$90 ranges are for “Exotic Uses”… Or, in Tool terms… “Rugged, Long-Term, Repetitive Use.” This is not a category used often in Jewellery, so my research on my own sets ended here. I HAVE an Ergonomic German-Made side cutter for my silver work, and it was a painful $20, on sale from $80, to buy. The number of Christmas Gifts, Child-Birth Gifts, and “Because I forgot to give you something LAST year” Gifts that have come out of that set I bought… well… If I was selling them I would say it would have paid for themselves at full price about 50 times over in the first year… But since they were all gifts, the value has been in the peace of mind the quality brings. Just as a cross-reference to all the Tool-Company talk… Try a Jewellery company’s prices for their industry-standard tools. https://www.artbeads.com/crimpers-pliers-cutters/ You’ll probably see a giant difference in prices that you don’t expect for tools of this size. Gesswein is another good source for specialty precision work tools. They are primarily a source for abrasive/polishing products for the jewelry and injection molding industries. They have a lot of stuff that would be of interest to anyone doing fine metalwork or model work. fred… I mean this in the most sincere, and heart felt way possible… I freakin’ LOVE you, man! Having you around seems to quadruple my scope of access to things I love to do! Oh, tip for you… Foredom Ceramic or Felt Polishing Wheels? Polish pretty much anything. From a soft gemstone, right on up to 100 year old encrusted engine parts. You can probably use any of their cleaning/clean up type rotary bits on far more than just your carving. Foredom is one of a handful of brands that I can actually get Dremel reps to, begrudgingly, admit are a better choice for their rotary tools than their own Dremel branded versions. With no puns or mocking intended, you rock, good sir. You rock. Thanks – I truly believe that it is by sharing our knowledge and ideas (however paltry or imperfect they might be) that we are all increased. Conversely – not sharing just wastes what we might have to contribute.